Tips: How to Sleep Better on a Hot Summer Night? This has been one super hot summer, and it doesn’t seem to be cooling down much, even in the wake of the Labor Day weekend, so it looks like the heat may last a bit longer this year. Although many of us enjoy the summer weather, getting a good night’s sleep seems almost impossible when it’s too hot. Sometimes even air conditioning doesn’t help. This can take a negative toll on your sleep schedule and rob you off your energy – and how can you enjoy a nice weather during the day when you’re so tired from the sleepless night? Stay hydrated: When we sweat, we cool down, but if we are not well hydrated we can’t produce enough sweat. Although many of us may be cautious about drinking prior to bed, that extra water will be expelled from your body through sweating. Avoid cold baths or showers: Taking a cold shower or bath may seem like a good idea, but it won’t be that helpful in cooling you down. Immersing yourself in the cold actually constricts your blood vessels, keeping the heat in. Stick with moderate temperatures to launch the cooling process in your body. Position the fan properly: Position the fan either close to the ground or near a window to ensure better air circulation. Sleep lower to the ground: Hot air rises, so the higher you are the more heat you are going to feel. 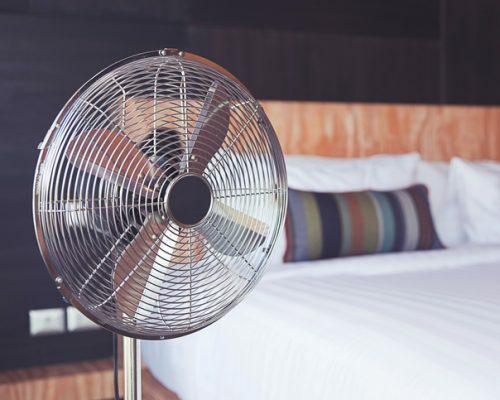 We aren’t suggesting that you put your mattress on the floor (although that’s an option, too), but you may wish to sleep on the main floor or in the basement during the summer months to stay cool. Opt for a different mattress: Thicker mattresses retain heat, keeping you warm. You may have never thought of having a separate mattress for the summer, but if you feel warm in bed throughout the year, you may want to consider a thinner mattress. Dress comfortable: Avoid wearing thick pajamas and ensure your sleepwear is breathable, preferably cotton, and loose-fitting. With these helpful tips, you may have greater success at falling asleep when the next heat wave kicks in.